Orange teapot ideal for 6 mugs. Théière orange brillant en grès fin pour un tea time illuminé! Cette forme de théière s'appelle "Brown Betty" est emblématique et incontournable de la vaisselle anglo-saxonne. 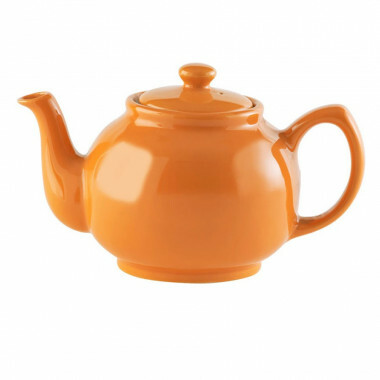 Enlighten your tea time with this bright orange teapot! This round shape is called "Brown Betty" and is iconic in the United Kingdom and Ireland. Its shape allows a better infusion of tea leaves and release all the flavours. Resistant in microwaves and in the dishwasher. May contain up to 1100ml, ideal for 6 mugs. It's a region known worldwide for its hight quality tableware. Ceramic dishware used to be transported by boat on the Trend and Mersey rivers on the way to other parts of England. Price & Kensington started to make different sizes of teapots, then the range broadened to mugs, cups, everything releated to "tea time". 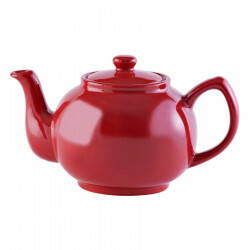 Specialty Tea collection offers lovely teapots and sandstone cups, red or taupe colour. Matte colours bring elegance and sandstone guarantees heat and shocks resistance. Red teapot ideal for 6 mugs. Resistant to microwaves and dishwasher.